A local activist group says the Israeli army has been using "intimidation" tactics against its members since they posted a video on Youtube of a soldier threatening Palestinian teens on Tuesday. The office of Youth Against Settlements in Hebron has been raided three times by Israeli soldiers since the video was posted, an activist within the group told Ma'an Saturday. Issa Amro told Ma'an that Israeli soldiers raided the office on Thursday night, Friday morning, and Friday night. In addition to searching the premises, Israeli soldiers "threatened" activists, demanding to know "who filmed the video" that was posted on Tuesday, Amro said. He added that Youth Against Settlements had received hate messages on their Facebook page saying "that we will be shot if we attempt to film more soldiers." But another activist, Muhammad Zghayyar, urged Hebron Palestinians to continue to film aggression by Israeli soldiers and activists as much as possible in order to "expose them to the world." An Israeli army spokeswoman did not immediately comment on the incidents. The video footage posted Tuesday shows an Israeli soldier harassing a Palestinian teenager and pushing him away before drawing and cocking his assault rifle after another teenager walked behind him. The soldier is then filmed shouting insults at both teenagers before kicking one of them in the leg. The soldier was suspended, but has since has received massive support online, media reported Wednesday. Only hours after his suspension, a Facebook page was created Tuesday in support of the soldier, clinching tens of thousands of "likes." Israeli soldiers invaded Hebron city, Ithna and Ash-Shiokh nearby towns, and kidnapped two Palestinians. The army also installed roadblocks, stopped cars and interrogated passengers. Local sources said the soldiers invaded Ithna town, west of Hebron, and kidnapped Fayez Ahmad Tmeizy, 36, after searching his home. Tmeizy is a Palestinian police officer. 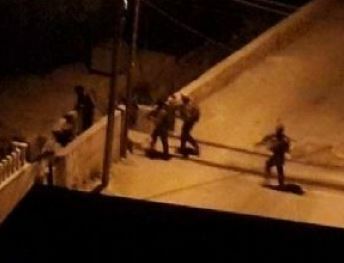 Soldiers also invaded the Ash-Shiokh town, northeast of Hebron, and kidnapped Saed Mohammad Halayqa, 27, after searching his home and beating him up. Furthermore, dozens of soldiers invaded various neighborhoods in Hebron city, and installed roadblocks at the entrances of Sa’ir town, northeast of the city, Yatta town and the al-Fawwar refugee camp, south of Hebron, and the Halhoul Bridge in the northern part. Eyewitnesses said the soldiers stopped and searched dozens of cars, and interrogated the residents while inspecting their ID cards. Further Israeli violations against Palestinians and their property continue in the West Bank, this week, with home invasion and harassment in the village of Awarta and the demolition of several structures in Khirbet al-Taweel. 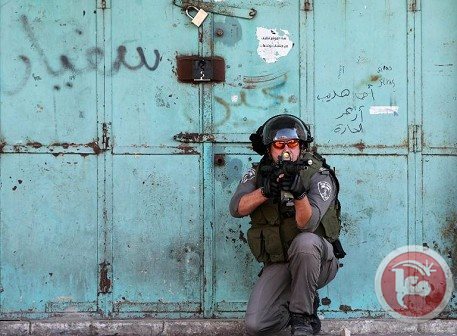 At 4:30 am, on Wednesday the 30th of April, a group of Israeli soldiers broke into a family home in the village of Awarta, near the illegal settlement of Itamar, according to a recent report by the International Solidarity Movement (ISM). 11 soldiers woke the family, under the pretext of conductiong a “security search”, upon which a member of the family asked to see the order and was shown a piece of paper written in Hebrew. Once inside the house, the ISM reports, the soldiers forced the family into the living room, where they confiscated their mobile phones. According to family member Muhammad Sharab, they were detained in their home for 12 hours. No one in the house was allowed to exit for work or school; there are six children in the family, all under the age of 14. During those 12 hours, the soldiers slept in the house’s bedrooms and used the shower. “I’m just following orders,” was his reply. The soldiers finally left the home and the village. Other reports surfacing in the village reveal soldiers raided another house, that same night. The house is apparently located in the same area where, just under two weeks ago, Israeli soldiers entered houses and fired several tear gas grenades. 20 Palestinians, including children, were taken to the hospital for tear gas inhalation. The village of Awarta has increasingly been targeted by the Israeli military, possibly due to close proximity of the illegal Itamar settlement. In the last two weeks, a new settlement road connecting with the main village road has been built, and resident report that many local olives tree were destroyed during the construction. In a related violation, on Tuesday the 29th of April, at 2:00 AM, the Israeli army invaded the small Bedouin village of Khirbet al-Taweel to demolish several structures, claining that they were built without permits. In total, three houses, several animal shelters and the village’s mosque were destroyed. Khirbet al-Taweel has an approximate population of 180 inhabitants, according to the ISM. 30 of them have now been left homeless because of the demolitions, 17 of which are children; the youngest only one-year old. In the raid, three families were forced out of their homes at gunpoint, with no time to collect their belongings and able to take with them only the most necessary items before witnessing the destruction of their homes. 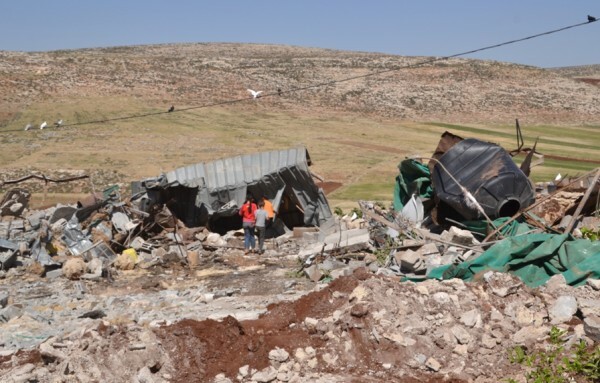 The Israeli army took two hours to carry out the demolitions, until 04:00AM, destroying three houses in addition to the village mosque, built in 2008. The families also suffered the loss of their water tanks, due to the demolitions. In order to get drinking water, they now have to walk 30 minutes uphill to get to the nearest town (Aqraba), and then back, ISM stated. During the day, Red Crescent provided the families with some tents. However, according to one of the women who were evicted, the army informed them that they were not allowed to stay in the area and had to leave immediately. During the past five years, the village has been the target of several demolitions. According to local villagers, this is simply a strategy from Israeli authorities to force an exodus fromlocal populations, thus expanding illegal Israeli farming settlements, located on the other side of the mountain from Khirbet al-Taweel. More than 500,000 Israelis live in illegal settlements across the West Bank and East Jerusalem, in direct contravention of international law and with the full complicity of Western governments, in the form of billions in foreign aid and weapons, each year. Despite the Israeli government's relentless appeal to officials and taxpayers, in regard to "security concerns", the Palestinian Authority has no official army, navy or air force to speak of. The infamous Hamas rocket attacks, which Western mainstream media outlets are so quick to respond to, do very little damage, in fact, as the default projectiles are not even equipped with guidance systems and are tipped with only a relatively tiny warhead, if any at all. Though outbreaks of serious violence do erupt from the Palestinian side, they are usually in response to Israeli violations and incitements against the Palestinian people and their property. with the majority of Palestinian child detainees being held on charges of throwing stones. Dozens of people were injured on Friday after Israeli forces dispersed protests across the occupied West Bank. In Nabi Saleh, five people were injured by rubber-coated steel bullets while several others suffered tear gas inhalation as Israeli soldiers dispersed the village's weekly protest against Israel's land annexation. Israeli forces fired at protesters as they marched towards their confiscated land. Some protesters responded by throwing rocks at Israeli soldiers. In Bilin, one person was injured and dozens suffered tear gas inhalation as Israeli forces dispersed a demonstration in solidarity with prisoners and a recent national reconciliation deal. Participants marched towards Israel's separation wall and raised Palestinian flags before being fired upon by Israeli forces. Mohammad Faris Yassin, 20, was hit in the thigh with a tear gas canister. Protesters also gathered in al-Masara village, south of Bethlehem, but were prevented from reaching Route 60 by Israeli soldiers, who threatened to arrest participants. The non-violent resistance movement is a key part of the Palestinian struggle against Israeli occupation. Peaceful Palestinian rallies in the West Bank are often met with a violent response by Israeli forces. The Israeli occupation army claimed that one of its soldiers suffered a moderate injury at dawn Friday when a hand grenade was thrown at a military patrol during a campaign in Nablus city. The Hebrew radio said that the grenade was locally made and exploded during an Israeli military activity intended to search for combat means. It added that two pistols and some ammunition and knives were confiscated during the campaign in Nablus. The Israeli occupation forces (IOF) stormed at dawn Nablus city and ransacked homes. They also clashed with Palestinian young men. Eyewitnesses told the Palestinian information center (PIC) that a large number of Israeli troops stormed the city at one o'clock in the morning today, and raided homes near the western cemetery as well as in the old city of Nablus and the neighborhoods of Ras Al-Ein and Kashika. They added that sounds of explosions were heard during violent clashes between the invading troops and young men at the entrance to the old city of Nablus near Qaryoun neighborhood. A woman living in an area overlooking the old city said that she saw Israeli soldiers detaining one Palestinian young man. Other eyewitnesses reported that Israeli soldiers encircled a group of young men in the western cemetery and fired a hail of tear gas grenades at them, which caused them to suffocate. 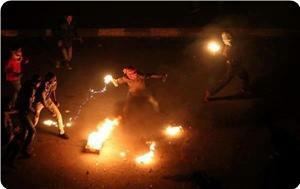 The clashes expanded to the areas of Mount Attour and 24 street, according to local sources. In Jenin, a number of Palestinian citizens suffered from tear gas inhalation during clashes with Israeli soldiers at an early hour today in Jaba town. A few hours later, the Israeli occupation forces set up roadblocks in the nearby village Fandaqumiya. No arrests among Palestinians have been reported. Escalated violence against the Palestinian people and their property, by both Israeli military and civilians, continued on Thursday, with reports of violations and abuses surfacing throughout the West Bank and the Gaza Strip. Israeli military vehicles invaded farmlands east of Khuza'a, located to the east of Khan Younes, in southern Gaza Strip, on Thursday. Five Israeli tanks and two bulldozers infiltrated the area, going about 200 meters into a region located to the east of Khuza'a, where they leveled land and opened fire on nearby houses as reconnaissance drones patrolled the area. Strip, deeming them off-limits to Palestinians and regularly opening fire on Palestinian farmers who approach this area. In the video, farmers returning to farm the land in Abassan, where Israeli soldiers had opened fire on them 2 days previously, were able to harvest their parsley crop for only half an hour before soldiers again began to shoot. A number of shots were fired into the air before the soldiers started to aim in the direction of the farmers and international support. 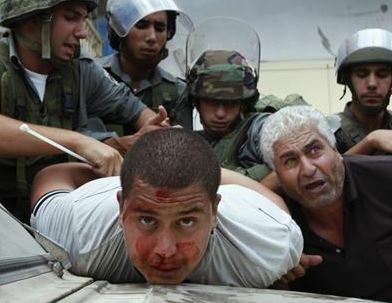 North of Ramallah, Israeli forces brutally assaulted four farmers Thursday morning, near the village of Aboud. Stationed in a military camp established on lands seized from Aboud villagers, forces detained and brutally assaulted the farmers as they attempted to work their lands near the camp. The farmers sustained multiple wounds and injuries and were subsequently hospitalized. In the Bethlehem region, Israeli settlers uprooted scores of olive saplings, Thursday, from Palestinian-owned land near Wadi Rahhal village, to the south of Bethlehem, said a local activist. The settlers uprooted 50 olive saplings in an area known as Khalit al-Nahli, near the village of Wadi Rahhal, according to Coordinator of the Anti-wall and Settlement Popular Committee in Bethlehem District Hassan Breijah. The settlers broke into and razed the area, built a room using tin sheets and wood, and prevented the farmers from accessing their lands before proceeding to destroy the saplings. According to WAFA, an Israeli court had previously ruled in favor of Palestinian landowners against Israeli settlers’ attempts to take it over. Also near Bethlehem, the army served demolition notices for property belonging to three people in Al-Khader, according to a local activist. Coordinator of Anti-wall and Settlement Resistance Committee, Ahmad Salah, said Israeli forces and ‘Civil Administration’ officers stormed ‘Um Rukbah’, an area located to the south of Al-Khader, serving demolition notices for structures used as a car wash, paint and maintenance shop as well as a barn belonging to three citizens. The citizens were given 45 days to demolish their property. Salah noted that Um Rukbah is the only area where residents of Al-Khader are allowed to engage in construction. For the past several years, this area has been targeted by Israel, which has been systematic in carrying out demolitions and serving demolition orders. Furthermore, Israeli forces seized marble slabs from a store in Husan, located to the west of Bethlehem. Member of Husan Village Council Taha Hamamra said that Israeli forces seized marble slabs that were placed in front of their owners’ store near Wadi Fukin junction, seizing a bulldozer and excavator used for the construction of agricultural roads, in addition. Just east of Hebron, Israeli settlers pelted Palestinians travelling along Road 60 with stones, causing damage to their vehicles. The settlers are reported to have come from ‘Kharsina’, an illegal Israeli settlement built on Palestinian-owned land near Hebron. No injuries were reported among the passengers. Furthermore, in the Hebron district, Israeli forces stormed and sealed off at-Tabaqa village, located to the southwest of Hebron. The army invaded the village, sealing off its access roads, before launching a large-scale search in the villagers’ houses. Meanwhile, forces sealed off Kharsa junction, located to the south of Doura, as well as the road which connects the villages, in the southwest of Doura. Yesterday morning, Israeli forces closed down the Islamic soccer club in Qalqilya, according to a local source. Mahmoud Qashmar, member of the club's information committee, said that the army stormed the club and secured it with red tape, which is to remain until the end of this year. He noted that they could not enter the club to find out if any items were seized by the soldiers. The club, which is considered the most prominent club in Palestine, had been closed down by Israeli forces, back in 2008, before it went back into operation in 2011, according to WAFA. Several of the club soccer players had been arrested by Israeli forces, the last one at a border crossing with Jordan as he made his way back home from a Doha soccer league. International acitivists have gained recent recognition by calling for suspension of Israel's membership in the Israeli Football Association, until Israel respects the human rights of Palestinians and observes international law, thus enabling Palestinian footballers to play and compete nationally and internationally. The Israeli occupation specifically impacts on Palestinian football by restricting movement of players within the West Bank, between the West Bank and Gaza, preventing them from taking part in international competitions. Israel also limits imports of vital sporting equipment. Players have been harassed, detained, imprisoned and killed.